Vietnam Women's Memorial in 2008. The Vietnam Women's Memorial is a memorial dedicated to the women of the United States who served in the Vietnam War, most of whom were nurses. It serves as a reminder of the importance of women in the conflict. 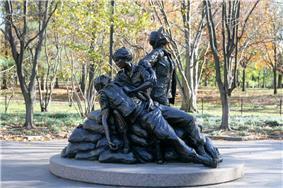 It depicts three uniformed women with a wounded soldier. It is part of the Vietnam Veterans Memorial, and is located on National Mall in Washington D.C., a short distance south of The Wall, north of the Reflecting Pool. It was designed by Glenna Goodacre and dedicated on November 11, 1993.